The first piano lesson can be very intimidating for both teacher and student. Everyone knows how important first impressions are, and no one wants their first piano lesson to go badly. The piano teacher is anxious to start off on the right track - the student's musical future is in the hands of his teacher! The student is nervous about starting something new and completely foreign. All these nervous feelings combined can be rather distracting, and the first lesson can end up a mere show of education - simply a social introduction between student and teacher. This isn't necessarily a bad thing, but a little learning can never hurt. Here I've compiled some information for piano teachers to remember on their first lesson. 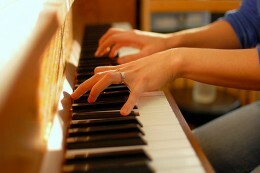 Put your nerves aside, breathe deeply, and plan your first piano lesson in advance. There is no need to "wing it." Remember, this is your first impression on your new student, and you want to begin your journey together headed in the right direction. Being organized in your mind first will help you be organized in your lesson. Know what you want to introduce on this first lesson; write it down if you need to. The first piano lesson is basically an introduction to the keyboard and to music in general. Sit your student down at the piano with good posture and point out the pattern of the keys - the blacks on whites. The pattern is determined by three black keys (triplets) then two black keys (twins) then three then two, etc. Talk with your student about the number of keys, and let him or her play around on the keys. Show the difference between high and low sounds by having your student play up and down the keyboard. Also point out which direction is "up the keyboard" and which is "down the keyboard." Have him or her play one key soft and loud alternately. If you have a grand piano, raise up the lid and let your student look inside at all the workings while you play high and low sounds. Show how the vibrations are slower on the lower keys and so fast you can't see them on the higher keys. Point out the way the hammers hit the strings and the way the "brakes" stop the music. Use flashcards to introduce notes. On the first lesson, you can introduce quarter notes, half notes, and whole notes. The quarter note is basic; it helps to explain to small children that the quarter note simply means to play once. Make flashcards that have different patterns of quarter notes and quarter rests, and have your student play these on the keyboard on any key. Show your student where Middle C is. This is where the first finger position begins. Use your desired lesson book to demonstrate the first simple song, which will probably only use the first three fingers of the right hand. Also tell your student the finger numbers for each hand. Music for Little Mozarts music books are a lot of fun and are geared for little children 4 to 6 years old. They focus on finger coordination and move at a good pace for young children. Alfred's Basic Piano Course is my favorite book series for elementary aged children. It starts off with teaching how to play before fully introducing staff reading. The books move at a good pace while introducing all the important concepts. John W. Schaum piano lesson books work well for older children, around 6 to 12 years old. This is your standard piano course; it has worked well for me in the past. The Schaum series focuses on note reading. A friend of mine recommends Bastien piano course. Fletcher Theory Papers are a great way to teach your students theory. These can be given out as homework for your student to complete during the week.